This story begins early last month, as I was hanging out with my preschooler at his end of year party. I chanced upon another mom and we chatted. Somehow going from how adorable our kids were, to our jobs, and then things like foot exfoliation. Probably a few topic in between. She asked if I ever tried “Baby Foot” She heard about it on an infomercial at home, and was immediately sucked in. She described these squishy booties you put on your feet, and keep on for an hour. Wash off, and go on with your day. Days later, massive peeling. It looked like she had peeled off her feet in the bathtub, which essentially she did. But gushed about the smooth, soft results. Hmmmmmmm. I do love to try new things. This sounded very interesting. Probably better than the pumice stone in my shower that I try to use each morning as I hop around on one foot at a time. So I headed to Amazon at home, and got 2 of them. One for me, and one for a test subject to try it on first. My 14 year old was surprisingly obliging to putting on the booties, and sitting for an hour with them on. We documented his progress with photos, I was suitably impressed. So I decided last week to give it a go. 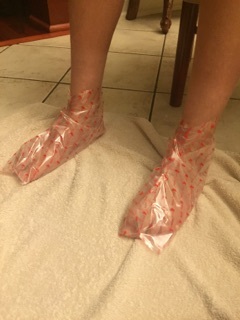 I wanted to do it sooner, but found it hard to find a whole hour that I could set aside to sit down with these gel things on my feet. You CAN walk with them, but it feels really weird, and definitely can’t run….. I didn’t time things very well as it turns out. After about 5 days, my feet seemed really dry. 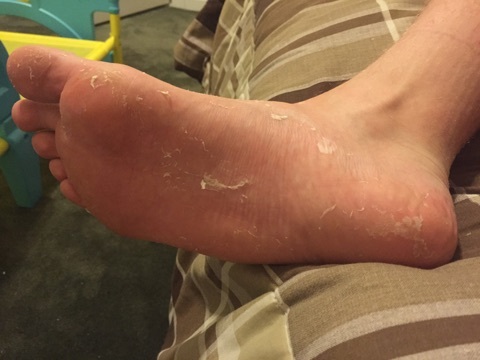 The next night, I took a hot bath to speed up the peeling process, and suddenly it looked like my feet had been grated. I panicked a little, realizing anywhere I walked barefoot would leave a trail…yuck. Anway, the next day… the day of the reception….. I still had peeling. I felt too nervous to wear strappy dress shoes that would expose my feet during their metamorphosis. Thoughts of walking across a dance floor, leaving little pieces of me behind were making me think twice about going. I ended not going, and kept socks on to stop the spread of my DNA. 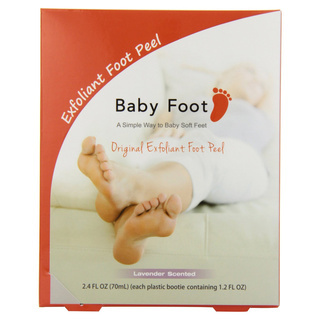 This entry was posted in beauty, humor and tagged baby foot, beauty treatments, dry skin, exfoliation, humor. Bookmark the permalink.